How quickly do global greenhouse gas emissions need to drop to get back to a safe climate? It’s a pertinent question when the Australian government is making great claims for its 2011 carbon legislation, but its aim is to reduce emissions by only five per cent by 2020. And even that is an illusion, because a significant share will come from buying offsets in the international market. And when proposed new and expanded coal mines in Australia are tallied up, they will add about 1.75 billion tonnes of carbon dioxide annually – about eleven times what the Australian government estimates will be saved by the carbon tax legislation. By 2020 or soon thereafter, Australia will be exporting nearly twice as much carbon dioxide as is Saudi Arabia today, as Guy Pearce explains. So what really needs to be done? The first consideration is when global emissions peak, and start to drop. At the moment, we are not close to peaking. The Global Carbon Project shows that global emissions are rising, faster and faster. Between 2000 and 2007, they rose at around 3.5 percent a year; by 2009 it was up to 5.6 percent. In 2010, we hit 5.9 percent growth, a record. The second question is what is a safe temperature increase. Whilst the world has talked for decades about 2 degrees Celsius (or around 450 parts per million carbon of carbon dioxide*), scientists increasing recognise that it is far from safe. This was recognised in the landmark 2009 “Safe Boundaries” paper which essentially found that the boundary was no more than 350 parts per million, or around 1 degree of global warming. (* assumed at equilibrium, so that the short-lived greenhouse gases are not relevant). But as James Hansen and his colleagues have established, it is hard to argue that anything above the Holocene maximum (of around 0.5 degrees above the pre-industrial temperature) can preserve a safe climate, and that we have already gone too far. The notion that 1.5 degrees C is a safe target is out the window, and even 1 degree looks like an unacceptably high risk. Our post on Hansen’s views has been the most visited post on this site. Unfortunately little work is done on emission reduction scenarios for less than 2 degrees, but Hansen provides one in his paper “The Case for Young People and Nature: A Path to a Healthy, Natural, Prosperous Future”. The left hand image (a) charts what happens to atmospheric CO2 if fossil fuel emissions are cut six per cent per year beginning in 2012, and 100 billion tonnes of carbon reforestation drawdown occurs in the 2031-2080 period. Chart (b) shows atmospheric CO2 with “business-as-usual” emission increases until 2020, 2030, 2045, and 2060, followed by five per cent per year emission reductions. 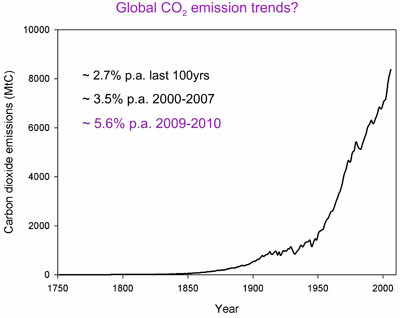 Figure (a) shows that 100 GtC reforestation results in atmospheric CO2 declining to 350 ppm by the end of this century, provided that fossil fuel emissions decline by 6% per year beginning in 2013. Figure 5 (b) shows the effect of continued BAU fossil fuel emission (just over 2% per year) until 2020, 2030, 2045 and 2060 with 100 GtC reforestation in 2031-2080. The scenario with emission cuts beginning in 2020 has atmospheric CO2 return to 350 ppm at about 2300. If the initiation of emissions reduction is delayed to 2030 or later, then atmospheric CO2 does not return to the 350 ppm level even by 2500. The conclusion is that a major reforestation program does permit the possibility of returning CO2 to the 350 ppm level within this century, but only if fossil fuel emission reductions begin promptly. What is significant here is that achieving a 350ppm target requires re-afforestation, or some similar means, of actively drawing down carbon dioxide from the atmosphere. 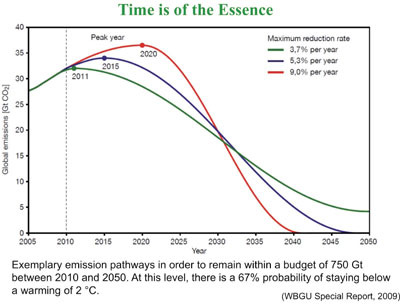 If the focus is on the (unsafe) 2-degree target, this chart (below) from a presentation made by Hans Joachim Schellnhuber to the 4 degrees or more: Australia in a hot world conference in Melbourne in 2011 shows that delay in reaching peak emissions makes the task more challenging. If emissions do not peak till 2020 (red line), then the maximum reduction rate is 9 per cent per year. Of course, as Hansen shows, with large-scale drawdown, we can do better than that. But the science behind these charts, and the political consequences, are not ones that we will likely hear from any of the major players in the climate policy debate. Not from Australian Conservation Foundation CEO Don Henry, not from Mitch Hook of the Minerals Council, not from Climate Change minister Greg Combet, or his opposition shadow Greg Hunt. The truth is just too difficult. And if you don't have the capacity to define and explain a problem, your chances of articulating a solution are zero. Perhaps its easier to give up on even 2 degrees and start talking about 3 degrees instead, as is the case with "reduction wedges" pioneer Robert Socolow. And that is really disturbing if you understand what 3 degrees means.